If you love Betty White, (and who doesn’t), you will enjoy her latest book, Betty White, If You Ask Me (And of Course You Won’t). 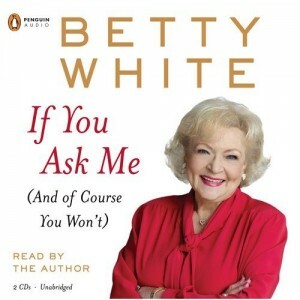 In the book, Betty covers a wide range of topics ranging from her crush on Robert Redford to her extraordinary love for animals of all shapes and sizes. I enjoyed reading the book and loved the many pictures in it. Getting to know Betty outside of her vast body of work in the entertainment industry was amusing and touching. I think she is someone, who at the age of 89, has shown that life has a great deal to offer if you choose to participate in it fully. Thank you Betty for all the laughs you have given us over the years. You are one great lady. This entry was posted in Uncategorized and tagged animal rights, Betty White, Books, Golden Girls, Hollywood, Hot in Cleveland, television. Bookmark the permalink.